You can now order spacers from Force Controls! 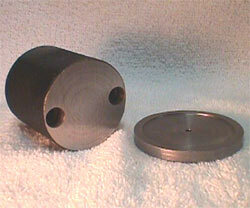 In order to use the Force Gage in a canning seamer, a Seaming Chuck Adaptor and Spacer is required. The Seaming Chuck Adaptor and Spacer allows the Force Gage to fit in the Seamer in such a way that the three together simulates a can of the same diameter and length. 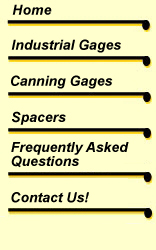 Determining the length of spacer to order is easy. Just take the height of the can size that you are using and subtract 3 inches for the models 1050CS and 1060CS. Subtract 4.25 inches for the models 8050CS and 8060CS. The remainder is the height of the spacer to order. Determining the "A" dimension which is needed to order a Seaming Chuck Adaptor is just as easy. The "A" dimension is the same as the diameter of the can being used. Cans are normally referred to as a 401 X 504 or a 603 X 510, etc. This means that in the first example, the diameter is 4 inches plus 1/16 inches. The length is 5 inches plus 4/16 or 1/4 inches/ The first number is inches and the last two numbers are the number of 1/16's of an inch to add to the first. This is a standard in the canning industry. This will assist you in determining the "A" dimension and spacer height without having to measure the can. Delivery is from stock. Remember! Include the spacer height and the "A" dimension with your purchase order when ordering and that a pair of each the Seaming Chuck Adaptor and Spacer is required for each can used. *Range: 25-600 lbs./10-270 Kgs. *Range: 25-600 lbs./10-270 Kgs. Overload Capacity: 1200 lbs. Overload Capacity: 1200 lbs. Approx. Weight: 3 lbs. Approx. Weight: 3 lbs. *Other ranges available by special request.